Horses that seem to gain weight on air can be extremely frustrating to manage for the horse owner, barn manager, veterinarian, farrier . . . no one is spared. It sounds like you’re headed in the right direction though, so I’ll just add a few tips I’ve picked up along the way. 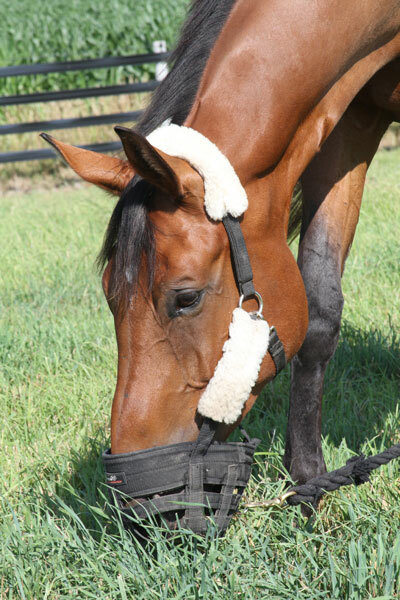 The grazing muzzle is “de rigueur” for any easy keeper being turned out on pasture. However, during the spring while pasture grass is in a fast-growing phase AND your horse needs to lose weight, consider turning him out in a dry lot only and not allowing ANY access to pasture. I agree that stall confinement is not the ideal solution for a number of reasons, so try and find a compromise between pasture and stabling. In completely removing all grain while trying to reduce their horses’ intake of calories and sugar, some owners have inadvertently created nutrient deficiencies. Provide a complete and balanced diet by introducing either a ration balancer or a multi-vitamin/mineral supplement. Some horses with weight problems have improved with this simple correction to their diet! Watch treats. An apple or ½ a bag of carrots or handful of molasses treats here and there may not seem like a big deal. However, the calories add up and the sugar may cause his glucose and insulin to spike, worsening any insulin resistance he may have. By the way, has your veterinarian examined him for Equine Metabolic Syndrome? Research is conflicting, but if your horse is sound, then I advise at least 30 minutes each and every day of some sort of controlled exercise. Since turnout does not equal exercise for these types of horses, it is up to you to design a workout regimen and make him stick to it. You are your horse’s personal trainer. Be creative—in addition to riding and lunging there’s also hand walking, free lunging, ponying, long lining (ground driving) and just plain ground handling. Equine Biggest Loser, here we come! In addition to a multi-vitamin/mineral supplement, there are products targeted to the metabolic system of your horse. Most contain ingredients that mimic the effects of insulin or are designed to help it work better. Ask your veterinarian if one of these supplements might be appropriate for your horse. Also ask about adding Omega 3 Fatty Acids. While it may seem counter-intuitive to add fat to an already overweight horse, research presented at the AAEP convention showed that omega 3s may help protect against laminitis. Finally, if your horse is truly diagnosed with insulin resistance and Equine Metabolic Syndrome, ask your veterinarian if the prescription medication Thyro-L might be helpful in accelerating weight loss (and therefore lowering his chances of developing laminitis). Since several studies have shown that this drug lowers body weight and increases insulin sensitivity in overweight horses, it may be a useful conversation to have with your vet. I also have a very easy keeper Paint mare. I would recommend looking into feeding all natural grains only as they are not processed and don’t have all the extra sugars etc. of most others. I did this a few years ago and it really really helped! It is also cheaper! I feed whole oats, alfalfa pellets (great source of omega 3) and, when I can afford it, barley. The first 2 are the most important though. Maybe this will help you too! Also, Smartpak sells a supplement called Omega Horse Shine that helps as well and also has Omega 3 in it. And there are founder supplements you can but at a feed store and feed daily that will help bind up the sugars from the grass and keep them out of the feet which causes founder. My favorite is called Remission. Good luck! My 5 yr old TWH mare is IR. I suggest also feeding 1/3 cup of psyillum a day, each and every day with the horse’s meal. It helps interfere with glucose absorption. My mare gets only alfalfa pellets for protein, and omegas, probiotics and vit/min supplement. Smart Pak has a great IR pellet for the vit/min part. Also the omega 3 part. The most important part is the exercise. I am lucky as I can pony her with my Kubota. It has also taught her to lead, whoa and pay attention when I ask her. Its hard to shy when tied to a Kubota as a school bus or garbage truck goes by. Hello, i am producing some electures for the students of the Royal veterinary College and was wondering if i could have your permission to use the photo of the lovely bay horse wearing the grass muzzle? With 6 years of grazing muzzle experience I feel like I could sell muzzles, I love them so much. My horses live on a hay farm and the muzzle has reclaimed both my horses from obesity. I have 2 comments. Weight loss is most efficient if the muzzled horse is pastured in a long stem or slightly overgrown field than in a mowed or eaten down field. Shorter grass enables access to the super sweet growing portion of the stem. Longer grass is harder to eat. Also the open nostril model muzzle (Easy Breathe) with the rectangular eating hole lasts longer on my parrot mouthed mare than the round hole model. Don’t know why. Everyday I put a nubbin of carrot in the muzzle before I put it on. That way they dive into it eagerly. It makes life easy.